I’ve written a couple of times before about what I do to backup all my important data. My last post on the topic was more than a year ago though, so I’ll forgive you if you’ve forgotten. 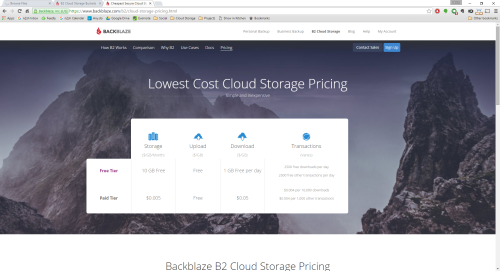 Here’s a recap: originally I was using a fairly traditional consumer backup service, ADrive. This worked well because they’re one of the few services that provides access by Rsync, which made it easy to run scripted backup jobs on my linux server. Their account structure didn’t really meet my needs, however: you pay for the storage you have available to you, not what you use. When I hit the upper limit of my account the next tier up didn’t make financial sense, so I switched. About 15 months ago I moved my backups over to Google’s Cloud Platform. This gives me an unlimited amount of storage space, and I just pay for what I use at a rate of $0.02/GB/Month. This has been working well for me. In December I found Backblaze B2. They offer a service very similar to Google’s (or Amazon S3, or Microsoft Azure, or any of the other players in this space that you may have heard of), except they cost a quarter of the price at $0.005/GB/Month. There’s even a free tier, so you don’t pay anything for the first 10GB. When I first looked at them their toolset for interacting with their storage buckets really wasn’t where I needed it to be to make them viable, but they’ve been iterating quickly. I checked again this week, and I’ve already started moving some of my backups over. In time, I plan to switch all my backups over. So far I’ve moved my documents folder and backups of my webserver, which totals about 2.5GB. That’s nice, because it means I’m still within the free tier. The next thing to tackle is the backups of all our photos and music, which combine at around 110GB. That means I have to transfer 110GB of data though, which is going to be a painful experience. I’m still thinking about the best way to do it, but probably the direction I’ll go is to spin up a VPS and have it handle the download of the backup from Google and the upload to Backblaze, then it doesn’t hog all the bandwidth I have on my home internet connection. The only other thing to think about with Backblaze is versioning. Google offers versioning on their storage buckets, but I have it disabled. With Backblaze there is no option (at least not that I’ve found) to disable this feature – meaning previous versions of files are retained and count toward my storage bill. I’m torn on this. The easy thing to do would be to disable it, assuming one of Backblaze’s future iterations of their service offering is in fact the ability to turn this off. I’m thinking though that the smarter thing to do is make use of it. For me and my consumer needs, that will most likely mean I put together a PHP script or two to more intelligently manage it, however. Some past versions are nice, but some of the files in my backup are changed pretty frequently, and I definitely don’t need an unlimited history. Still, I’m very much pleased with the price of B2, and watching the feature set rapidly improve over the past couple of months gives me confidence that I can move my backups over and keep them there for the long-term, because the transition from one service to another is not something I want to put myself through too often.